On a trip of this nature, one of the most important things to consider is the size of your backpack. Your pack is basically your home away from home: it holds your clothes, your toiletries, medical kit, maybe a journal or some pictures from home. You carry it everywhere when you arrive in a new place, you secure it next to you when you’re waiting for your bus, it’s your livelihood. And if it’s too heavy or bulky, well, you can be seriously hindered. Like a lot of other travelers, Tim and I are constantly comparing the size of our packs to other people’s packs. It gives us a silly joy to see that our main backpacks are usually smaller than some other people’s day bags. For the amount of time Tim and I are traveling, we have pretty small bags: about 10 kilos in each backpack, with another 0.5 kilo each in our little day bags. What does all of this have to do with a post about Leeds you might ask? Only this: For 6 months Tim carried a present in his bag for our friends Paul and Caroline who live in Leeds. We purchased it on our third visit to Buenos Aires and were holding it specifically for our visit to see them. And while the present itself wasn’t large or heavy, the point is that space in backpacks is at a premium and you never want to add extra things unless you absolutely need to. So to carry a present with you for 6 months can only mean one thing: it’s completely worth it. 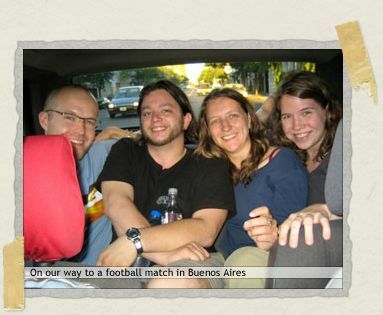 We initially met Paul and Caroline on the second day of our trip, during our first visit to Buenos Aires. Immediately the four of us clicked and we spent several more nights exploring that beautiful city together before going our separate ways. We spent time with them again only a few weeks later, though, in the sleepy mountainside village of El Bolsón. There we spent some glorious days together, each couple in their own private cabin, eating enormous amounts of Paul’s professionally cooked food. And the last time we would see them was in Mendoza, the wine capital of Argentina, before they headed to the West Coast of the US to tandem bicycle their way from Seattle to San Diego. Despite having known them for only a few short hours on that first night we spent in Buenos Aires together, we made plans to visit them in Leeds. We talked about spending several days with them there, Paul cooking up a storm and the four of us spending hours talking together. It sounded like a grand idea. Now, to put this in perspective, I should mention England wasn’t even on our itinerary when we decided to visit Paul and Caroline in Leeds. And so I probably don’t need to point this out, but to add another country (and an expensive one at that) to your itinerary during your trip can only mean one thing: it’s completely worth it. Anyway, after having wonderful visits in Essex, East Croyden, and St. Albans the day had finally arrived for us to take a bus from central London up to Leeds. Now, being from the US, I have absolutely no knowledge of English geography. In my simple mind, there’s London…and, well, there’s everything else around London. And, you know, I figured all those “everything elses” were rather close to London. I mean, it’s England after all. How big can it be, right? It turned out I was decidedly wrong. So after having a quick geography review given to us by the bus company, Tim and I boarded a bus bound for the lovely Leeds, located very north of London about 4 hours away. 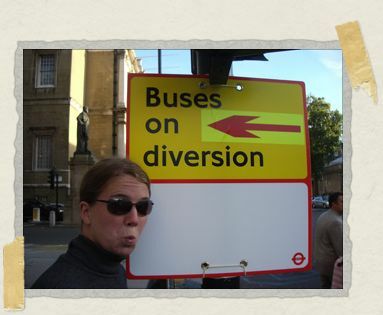 A quick side note: Prior to purchasing our bus tickets from London to Leeds, all of our English friends – which must be at least half the country given how many English people we’re friends with – warned us that English buses are “rather grim” and should be avoided. We were strongly advised to take the train, although it would be much more expensive to our backpacker budget. And so I can say, after riding on quite a few lovely English buses, I have determined all of our English friends have eaten a few too many fish and chips and drunk a few too many pints. But was riding the bus from London to Leeds, possibly risking our lives and god knows what else by doing so, worth it? Absolutely: because the following four days we spent visiting Paul and Caroline would prove to be some of our most favorite days of our trip so far. well, the septa strike is finally over here. so we can all go back to riding with chickens and tear gas. With regards to riding on buses, I take it your friends have never ridden on a Baltimore bus, a Virginia Bus, or Washington DC bus. Although I never had tear gas thrown at me or had to sit with a Chicken named Camilla (Gonzo was MIA) I did have to deal with really creepy looking Goths… Not that I have anything against Goths at all, but these ones looked like they belonged in a Rob Zombie movie (in other words they were CREEPY!). Anyway, I hope you enjoy more adventures in transportation and if you should have to share the bus with any alligators please get their phone numbers for me! ' style='position:relative;' height='17px' width='17px' /> Thanks! Just for the record Philsie…I was out sick yesterday. Having riden on a D.C. bus myself Broken Weebel, I will confirm that there is "Goth" and then there is possible vampires.